In this portion, I will go over the procedure of adding HP StoreVirtual VSA 2014 to a vCenter HA cluster and how to allocate shared datastores to the server cluster. HP StoreVirtual VSA paired with the D2200sb storage blade is an interesting technology. It is a relitevely inexpensive shared storage option for blade servers, but in only using one storage blade paired with a single server you end up having a single point of failure if either of the pair fails. The best course of action would be to use two pairs in case of such a failure or to allow upgrades or changes that would require reboots to a blade server in the pair. Unfortunately, I don’t have a second D2200sb. I do however have outside DAS connected to the Oracle/SUN servers that replicates the main cluster storage. Sometimes you just have to work with what you got a.k.a. “The Duct Tape Method”. The first step is to create a new Datastore on the host paired with the D2200sb. 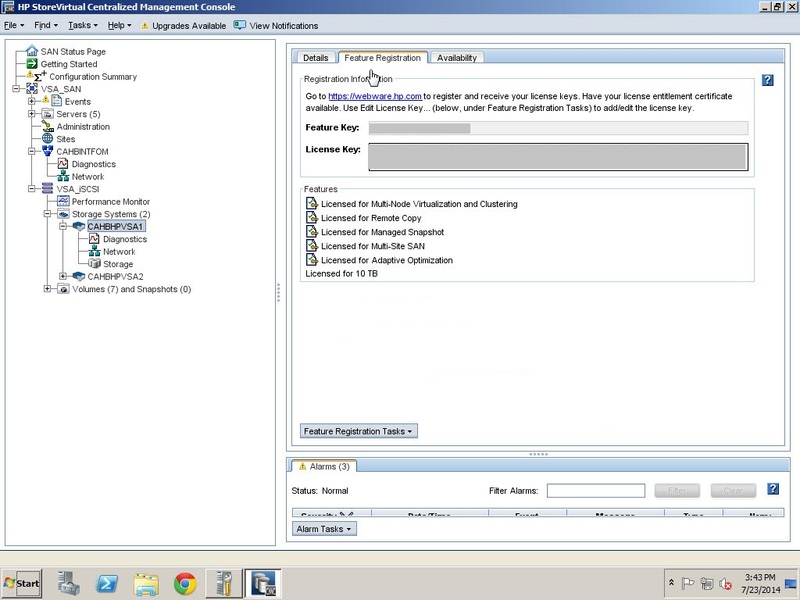 On the Configuration tab of the partner blade, choose Storage configuration and select Add Storage. You should see the storage blade under the new Disk/LUN. 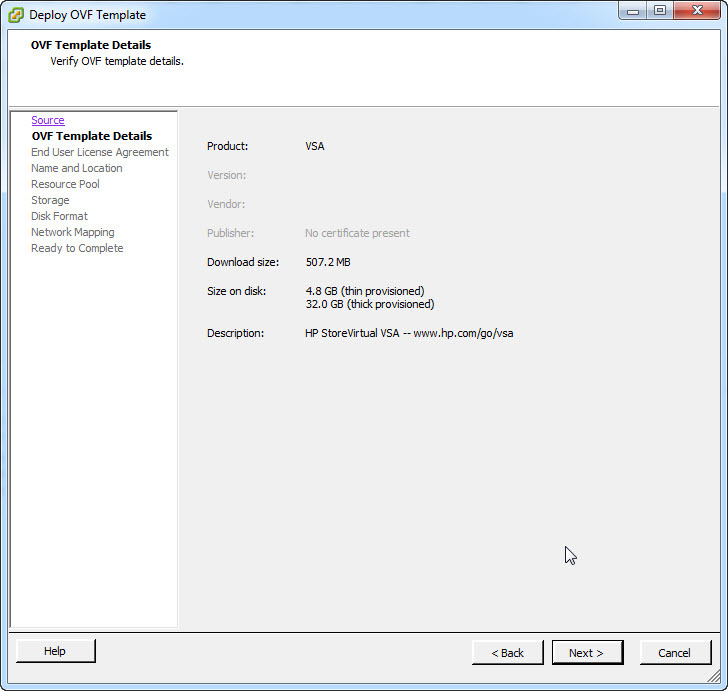 Format to VMFS 5. Now we will deploy our VSA OVF templates onto the newly created Datastore. My VSA appliances are licensed for up to 10 TB each. For this setup I will be using two VSA virtual appliances for the one storage blade along with a single HP FOM (Fail Over Manager) virtual appliance. In a perfect world, if I had two storage blades, I would deploy a VSA appliance on each Datastore. Because my storage blade is only 5.4 TB of usable space, it isn’t really practical to use more than one 10 TB instance of VSA for each storage blade. The next step is adding disks to each VSA. To split up the 5.4 TB Datastore, I chose to use four 540 GB disks on each VSA. The disks must be set to independent persistent. 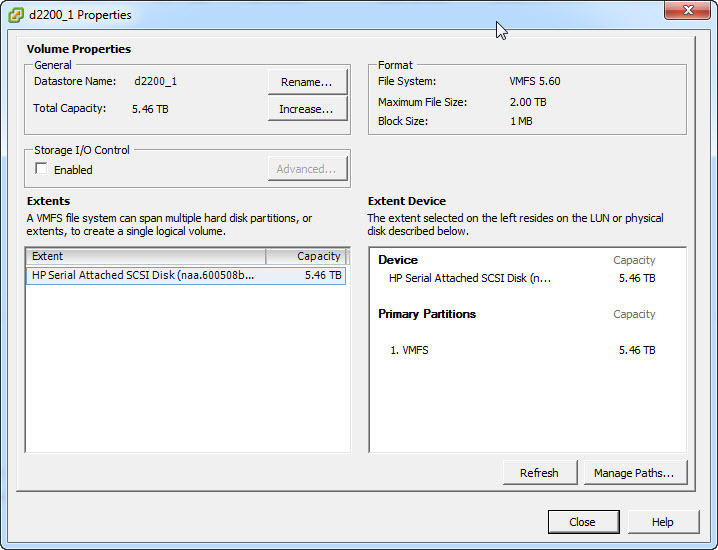 Then add the virtual adapters to the appropriate iSCSI port groups. Hard disk 1 is the disk created during the OVF deployment. Add virtual disks from the storage blade starting with device node 1:1. Disk should be set Independent Persistent. Choose the correct iSCSI port group for the first adapter. Make sure to add a different iSCSI port group for multipathing. Turn on the appliances and open a console window to each. Open a console to the newly deployed virtual appliance and enter “start” to log in. First you must configure the first network adapter. Add the host name and the networking configuration for one adapter. Then setup the second adapter. Note that only one adapter is configured with a gateway. Next we install the HP StoreVirtual Centralized Management Console. It is a relatively straight forward process. After installing, open the StoreVirtual CMC and find systems on the iSCSI network. You can then create a host cluster for a shared resource pool with the Create Management Group wizard. When adding a ESXi host attached to vSphere, be sure to use the vSphere server IP address. Continue through the Installation procedure with your desired location settings. Upon starting the CMC choose Find Systems from the Getting Started section. Given the range, most systems should populate automatically. Creating a new cluster group. List of hosts under a sample cluster. You can add hosts directly to a cluster under Edit Server Cluster. When adding an ESXi host use the Initiator Node Name under the storage adapter configurations for that host. Note the Node Name for the Host in vSphere. The next step is creating a new volume and assigning your host cluster. After configuring sizing, assign servers. Finally, to add licensing to a VSA appliance, select the VSA host in Storage Systems and navigate to the Feature Registration tab. Using your entitlement certificate, you can access the License Key from https://webware.hp.com. Now that the volumes are shared with the server cluster, you can add a new Datastore in vSphere under Inventory>DataStores and DataStore Clusters.